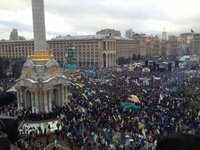 The Maidan all-Ukrainian Association, which represents the pro-EU demonstrators, has said on Facebook that members of the Berkut riot police squad and interior troops are being moved into the center of Ukraine's capital for possibly storming Independence Square, which is under the control of the demonstrators. "Bekut forces and Interior troops are being pulled into the center of Kyiv. The storming of Maidan (the Independence Square) may happen this night and the next ones. It is very important to be on Maidan this night. The more of us will be there, the less probable the violence," reads a statement posted on Facebook on Wednesday.